A couple of weekends ago I told you about how I had committed to participating in a craft show to support Relay for Life and that I was making cards to sell (proceeds go to RfL) and putting together simple kits to do Make It and Take It with kids. 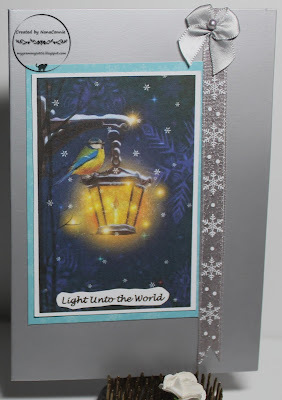 Today I want to share with you a couple of the cards I've finished and cards which are samples for some of the kits. Settle in because it's a long post with several photos. 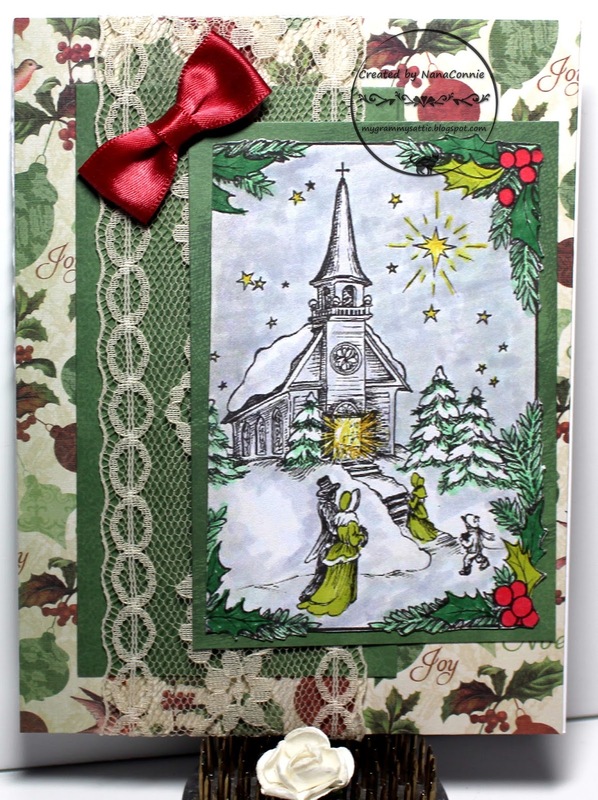 This first card has a lovely vintage church scene (a friend stamped up a dozen of these onto CS and gave them to me to use either for sale or for Make It, Take It kits.) This has to be one of my favorite Christmas stamps and I'm trying to buy it from her! I colored it with ProMarkers, then fussy cut it to preserve the places where the leaves and berries are outside the box. I matted it with a stitched rectangle die cut (Memory Box.) I added lace from my stash and backed it with green CS before layering it onto the background dp (Recollections.) I added a red, bow-tie bow and called it finished. If I use this vintage image for kits, I'll let the kids use it in black and white or they can choose to color it with pencils I'll have available for them. This second card is done with a pre-colored image which I found on a clip art site. 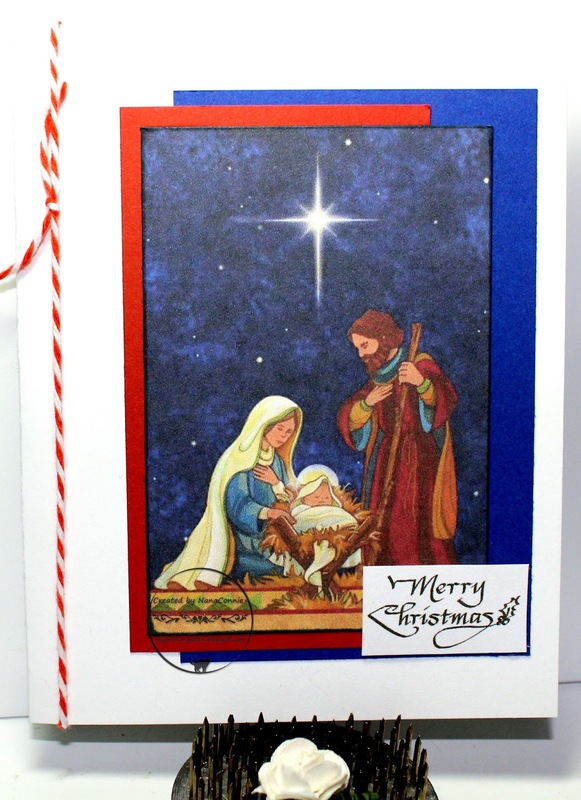 I just did a Google search for "Christmas Images" and chose this one from the first freebie clip art page I found. Very fast and simple because the coloring was already done. Again, it could be used for kits for kids because of the simplicity. I cut the image, matted it twice with white and blue, then mounted it onto silver wrapping paper which became the card front. I added a strip of silver ribbon which I cut at one end into a dovetail. I added the silver bow (one of those I make by the dozens and toss into my stash for future use) and the printed sentiment. This one took me about 15 minutes to complete. Finally, here's one for which I've already started making the kits and I have it in two, very similar versions. These are fabulous Connie, I hope you have a fabulous time and that you raise lots of money for the charity. 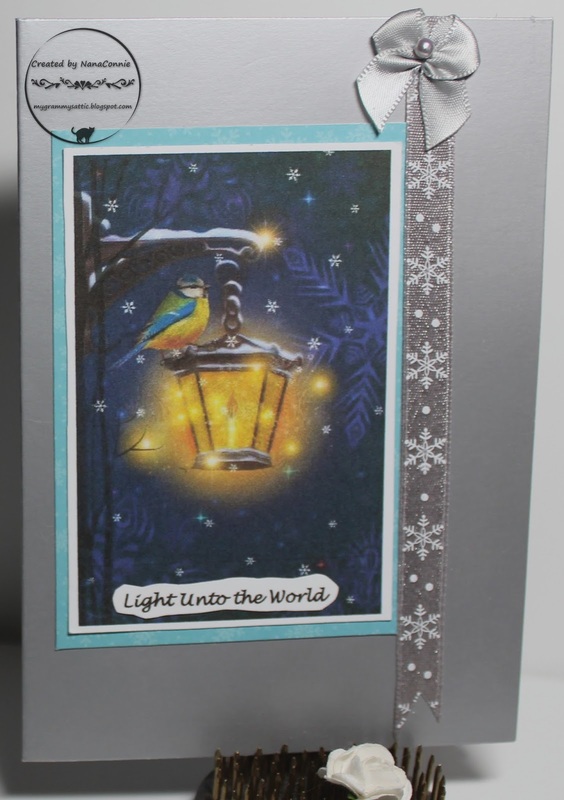 Pretty card with a lovely scene! Thanks so much for playing along with us at The Mod Squad Challenge Angie, Challenge Host. 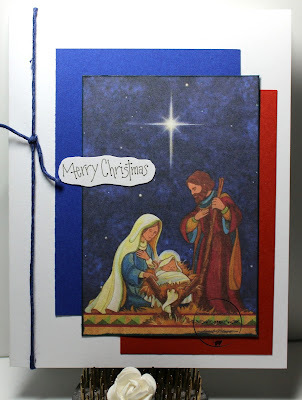 Fabulous cards and such a wonderful idea for the kits for the children. Great design I love this sweet card. Thank you for sharing this wonderful card with us on CWAA. A lovely looking card with lovely image and christmas feeling to it. Thanks for joining us over at the Paper Shelter this week. Lovely collection of cards. Lovely work! Thanks for joining us over at the Winter Wonderland this time.